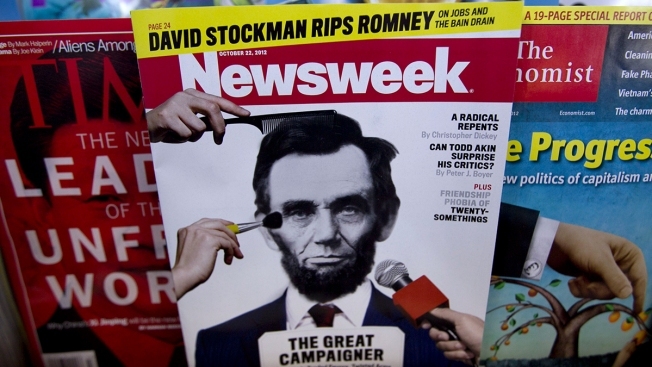 In this Oct. 18, 2012, file photo, a copy of Newsweek is seen in Portland, Maine. Newsweek's former parent company IBT Media pleaded not guilty in New York on Thursday to charges that it manipulated finances in an effort to keep the magazine operational, NBC News reported. The charges from the Manhattan District Attorney's office include fraud, money laundering and falsifying records, and detail a scheme to borrow money for computer equipment that was then funneled to Newsweek. The indictment accuses two individuals — William Anderson, the CEO of Christian Media Corporation, and Etienne Uzac, the co-owner and chairman of IBT Media — of having hatched a fraudulent plan that included an auditor named Karen Smith, whom the indictment said authorities could find no evidence of. Uzac defended himself in a post to his Twitter account, writing, "I believe this very aggressive investigation is fueled by retaliation against me and my news media company for having uncovered that that Manhattan District Attorney Cyrus Vance Jr. declined to press charges against Harvey Weinstein after his attorney paid Vance money."